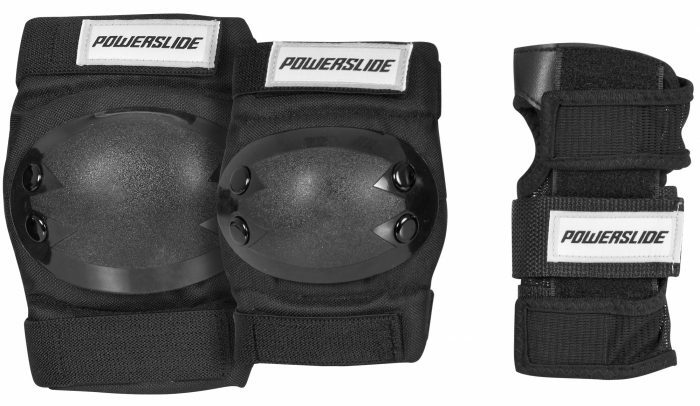 Powerslide “Basic” knee- and elbow pads have an anatomically shaped body for a perfect and snug fit. The outside material is made of light weight and resistant 600D nylon. The sock sleeve is made of cotton including elastic spandex material. Its very comfortable to the skin. In conjunction with the two Velcro straps the sock helps to keep the protectors in place in case of a fall. The wristguard is made of light weight and resistant 600D nylon material. The three velcro straps keep the wristguard securely in place.